While most engineers concern themselves only with the behavior of materials, machines, and the environment as they are affected by physical laws, user interface engineers also must consider the behavior of humans as they interact with materials, machines, and the environment. The human-machine interaction is becoming an increasingly important aspect of the industrial field, as technology permeates every avenue of life. Thus, user interface engineers are responsible for making sure people can interact with technology-driven products in an effective manner. Hundreds of companies are producing tools, products, software, and applications to make user interface engineers’ jobs more manageable. The technology, however, must work for the engineer in order to be effective, and we have searched for the top UI tools that do just that. User interface engineers cannot afford to get bogged down with the technology or the processes involved in building cost-effective products that meet users’ needs and expectations. We have chosen tools for their ability to streamline the user interface engineers’ workflow, to allow the engineers to control the objects and connect the code quickly and easily, to promote collaboration among UI engineering team members, to deliver better prototypes that reduce production costs, and to create more realistic models and simulations. We also have included some of the most robust CAD programs that allow for comprehensive 3D design, documentation, and simulation by UI engineers. Our top 25 UI tools for user interface engineers are listed here, in no particular order. Altium Limited, a software company providing PC-based electronics design software for engineers, offers Atmel Qtouch. With Atmel QTouch, UI engineers use the Altium Designer’s platform-based data model to link all aspects of electronics product design into one process and in a single application. Altia Design, “the centerpiece of Altia’s tool-chain,” is a detailed, completely functional, fully integrated interface that engineers turn into deployable code. With Altia Design, UI engineers also completely control custom objects and then connect to application code or simulations. GrabCAD is known for its role as a leader in the Open Engineering movement, and it aims to help engineers speed up the process of getting products to the market by enabling collaborative product development. Specifically, GrabCAD Workbench allows teams on any CAD system to sync local CAD files to cloud projects, track versions, and lock files to prevent conflicts. For UI engineers working in teams, GrabCAD Workbench is a must-have collaboration tool. Autodesk Inventor, 3D CAD software, provides easy-to-use tools for 3D design, documentation, and product simulation. UI engineers can design and validate products with Inventor’s Digital Prototyping to deliver better products, reduce development costs, and get to market more quickly. Based on the 3DEXPERIENCE platform, CATIA offers “a unique Digital Product Experience” for users. CATIA 3D Master is 3D CAD design software that allows UI engineers to focus on sustainable development. SketchUp Pro is the choice of hundreds of thousands of professionals who need an all-purpose solution to complicated, expensive CAD software. UI engineers appreciate SketchUp Pro’s range of tools that span the simplest to most complex of tasks. UI engineers choose KOMPAS-3D when looking for a flexible 3D modeling system to create models using several methods, including bottom-up modeling using finished components, top-down modeling by designing components to match specific designs, modeling based on layout drawings, or a combination of these modeling methods. The result is an editable associative model. After a five-year development period geared toward removing workflow bottlenecks and working to make Rhino faster and capable of handling much larger models and project teams, Rhino 5 is available as “the most stable version ever.” With more than 3,500 enhancements and 40,000 pre-release users, Rhino 5 is a popular choice among UI engineers. TurboCAD offers a wide selection of CAD solutions perfect for UI engineers, including TurboCAD Windows products and TurboCAD Macintosh products. TurboCAD Pro Platinum is the premium, professional CAD package. TurboCAD Pro Platinum includes all of the technology for drafting, detailing, modeling, rendering, and extensive file sharing, plus advanced tools for design, making it a top choice for enterprises that promote collaboration among its engineering team members. 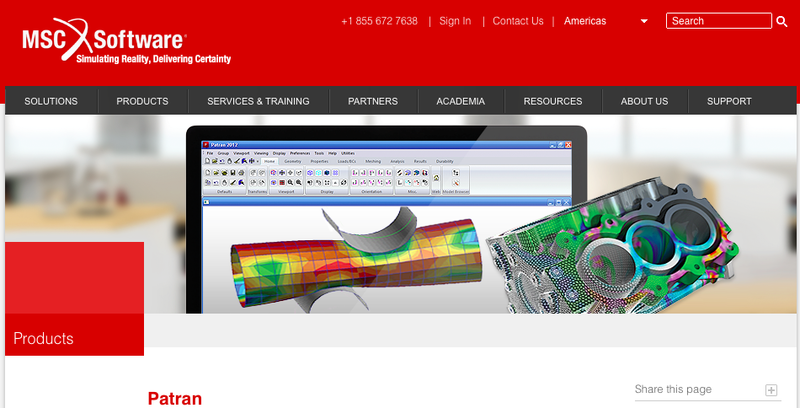 Patran is “the world’s most widely used pre/post-processing software for Finite Element Analysis (FEA), providing solid modeling, meshing, analysis setup and post-processing for multiple solvers including MSC Nastran, Marc, Abaqus, LS-DYNA, ANSYS, and Pam-Crash.” Patran’s complete FEA modeling solution ensures that UI engineers’ virtual prototypes provide fast results for evaluating product performance against requirements and optimizing designs. MapleSim is an advanced system-level modeling solution that “applies modern techniques to reduce development time, provide greater insight into system behavior, and produce fast, high-fidelity simulations.” With MapleSim, UI engineers are able to build even the most sophisticated of systems while still minimizing development time and costs. SolidFace Professional, a 2D/3D parametric historic constructive CAD modeler, also allows UI engineers and other users to complete project creation entirely in 2D. Because SolidFace is the result of Parasolid Siemens 3D modeler core and 15 years of UniCAD 2D/3D development, it has powerful detailing, solid modeling, assembly, and parameterization capabilities. SpaceClaim, “the world’s fastest and most innovative 3D direct modeler,” aims to make technology work for UI engineers. With SpaceClaim, working with 3D models is less complicated because users can create, edit, or repair geometry without spending time on the underlying technology. UI engineers choose Scheme-It as a solution for drawing circuit diagrams. The online schematic and diagramming tool allows users to build and share electronic circuit diagrams and includes a comprehensive electronic symbol library and integrated Digi-Key component catalog allowing for a wide range of circuit diagrams. A free software tool, Fritzing supports designers and UI engineers who work creatively with interactive electronics. As part of the open-source hardware initiative, Fritzing offers a software tool, community website, and services that allow users to document prototypes, share them with others, teach electronics in a classroom, and layout and manufacture professional PCBs. UI engineers often use Fritzing Fab to easily and inexpensively turn their circuits into a custom-made PCB. Renesas Electronics is the result of the 2010 merger between NEC Electronics and Renesas Technology and strives to respond to customer needs with the company’s creative power and technology innovations. Thee Renesas Embedded GUI Solution Kit stays true to Renesas’ mission because it offers a quick and easy way for UI engineers to add cost-efficient LCD touch screens to any embedded designs. Available from IBIS Solutions, easyGUI allows for more creative development with less difficult programming. easyGUI includes a complete graphical library in plain C code, plus all necessary graphical routines, making it easier for UI engineers to complete their jobs more efficiently. An LGPL-licensed user interface framework, Disko allows UI engineers to build flexible applications quickly and easily. Specifically, Disko Framework is an embedded Linux UI Framework. PEG Pro is a software solution for UI engineers who want to create complex, high-color depth embedded graphic applications. PEG Pro is intended for use “in the development of GUI applications in automotive, consumer electronics, infotainment and medical devices” and runs on a variety of real-time operating systems and microprocessors. The Kanzi UI Solution from Rightware, “the leader in interactive 2D and 3D UI software,” is an advanced design and deployment solution for automotive, mobile, and consumer devices. Kanzi is a comprehensive solution that includes UI design tools, runtime and complimentary libraries that separates the designer and engineering tasks across the workflow, making it a great solution for UI development teams.